Google has introduced the light-weight Android version, Android Oreo (Go Edition) and brands like Nokia, Micromax, Lava, etc had joined the bandwagon. Now it looks like Samsung is launching an Android Go smartphone edition through its popular J-series. 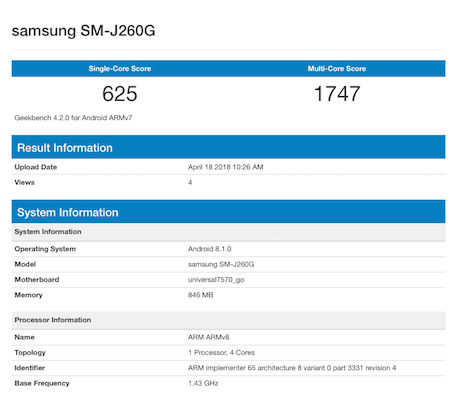 The phone titled Samsung J2 Core with the model number SM-J260G has just surfaced on Geekbench, dispensing its specifications. The phone packs with a 1 GB of RAM, in-house Exynos 7570 quad-core processor. The benchmark results on a single-core processor received a score of 625 and on a multi-core processor, the score is 1,747. These specifications fit the Android Go requirement set by Google.